This December 2016 video is called Daniel Libeskind‘s Jewish Museum – Berlin. The Israeli government is continuing its ferocious campaign of censorship and repression aimed at anyone who dares criticise its policies. At a German-Israeli government consultation meeting in early October, ultra-right Israeli prime minister Benjamin Netanyahu presented Chancellor Angela Merkel of Germany with a letter calling on her government to stop financial support for the Jewish Museum Berlin. The museum was accused of “anti-Israel activities” because it had sought, among various other activities, to engage in dialogue with Muslims and other religious communities. 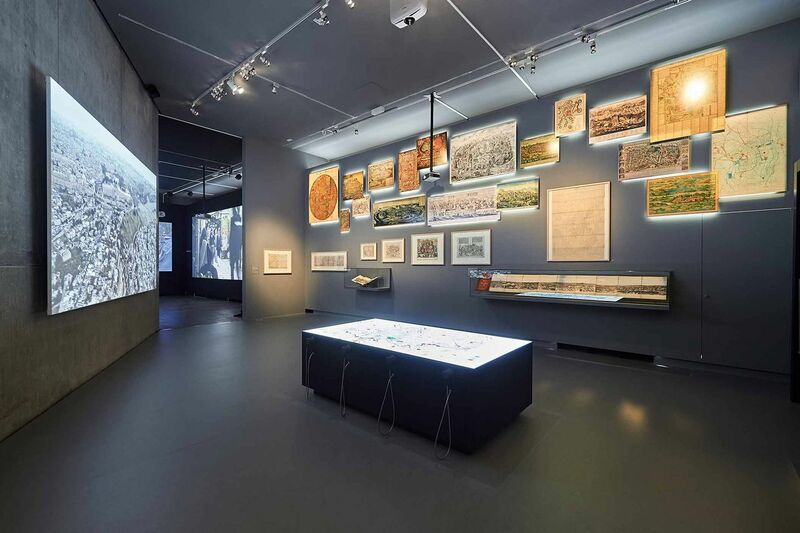 The Jewish Museum, opened in 2001 and housed in a spectacular building designed by Jewish Polish-American architect Daniel Libeskind, documents the centuries of Jewish culture in Germany that the Nazis tried to wipe out. It also organises eyewitness talks with Holocaust survivors, awards prizes for tolerance and civil courage, and seeks to instil a comprehension of the consequences of anti-Semitism and the crimes of the Nazis in its many visitors and countless school classes. It is one of the most popular museums in the German capital and throughout Germany. By the end of 2016 the museum had attracted nearly 11 million visitors. In addition to the Jewish Museum, the letter attacks about a dozen other organisations and institutions that criticise the policies of the Netanyahu government, reject the Israeli occupation of the West Bank and the Gaza Strip, promote dialogue between Jews and Palestinians, or merely provide humanitarian aid to Palestinians. It calls on the German government to stop providing financial support for these allegedly “anti-Israeli organisations”. They include non-governmental organizations (NGOs) and initiatives such as the German Protestant churches’ “Bread for the World” and the Catholic Church’s “Misereor” aid agency. “Bread for the World” is accused of promoting initiatives such as the “Coalition of Women for Peace”, … and supporting B’Tselem, an Israeli human rights organisation that seeks to “end the Israeli occupation”. Misereor is accused of supporting “Breaking the Silence”, a coalition of former soldiers who criticise the violation of human rights in the Palestinian territories. The Berlin Film Festival and the Left Party’s Rosa Luxemburg Foundation are also accused of “anti-Jewish activities”. The document goes on to condemn the magazine +972 published by the Green Party’s Heinrich Böll Foundation for allegedly opposing Israeli interests, citing writers for the magazine who have “regularly” accused Israel of apartheid. Also listed in the letter are funding programs of the German Foreign Office and Ministry of Development. The 7-page letter to the German Chancellery and Development Ministry was made public earlier this month, and various media outlets reported on it. The source of the letter, however, was not initially clear, because it contained neither a sender nor a signature. It has only now emerged that it was personally handed over by Netanyahu. Opposition to the Israeli occupation of the Palestinian territories is not anti-Semitism. Rather, it is the Netanyahu government in its struggle against the Palestinian population and the Israeli working class that relies on extreme right-wing forces—entirely in the tradition of anti-Semitism. The WSWS recently published a comment noting that Israel has become a site of pilgrimage for far-right politicians from around the world. This is so obvious that some Israeli media have referred to the Yad Vashem Holocaust memorial as a “washing machine” where right-wing extremists can cleanse themselves of charges of anti-Semitism. Ultra right-wing politicians who have recently received a red carpet welcome at the memorial include Italian interior minister Matteo Salvini, Philippine president Rodrigo Duterte, Hungarian prime minister Viktor Orbán and his Austrian colleague Sebastian Kurz. This affinity between the extreme right and Netanyahu’s government has been underlined by the reaction to the Israeli letter. It has been enthusiastically greeted by the xenophobic, far-right Alternative for Germany (AfD), which sits in the German parliament. In a guest commentary for the national-conservative Israeli media network Arutz Sheva, Petr Bystron, the AfD’s chairman in the Bundestag’s foreign affairs committee, warned against anti-Israeli lobby groups that had allegedly infiltrated senior German government circles. They were spreading one-sided reports of human rights abuses, according to Bystron, to slander Israel as “racist” and as an “apartheid state”. Bystron claimed the AfD was the only party in Germany that opposed the supposed importation of anti-Semitism and Islamist terrorism via uncontrolled mass immigration from the Middle East. In addition, the AfD planned, he claimed, to expose the flow of money from Berlin and Brussels to the well-connected “anti-Israel” lobby. In fact, the very same Bystron recently took part in a trip to South Africa to participate in exercises carried out by the “Suidlanders”, a right-wing, white “survivalist” group preparing for a “race war” against the country’s majority black population. One can easily anticipate that Bystron and AfD party leader Alexander Gauland may also soon be on the Yad Vashem invitation list. Netanyahu’s attempt to squeeze off funding for the Jewish Museum plays into the hands of the far right in Germany. Memorials and museums recalling the Holocaust and Nazi crimes have always been a thorn in the side of right-wing extremists. Now the Israeli government is attacking an institution that seeks to educate millions about these crimes. Netanyahu’s Embrace of Ethno-nationalists Endangers Jews in Europe. Israel’s right-wing is seduced by European nationalists’ warmth toward the Jewish state, and their hostility toward Islam. But an illiberal Europe intolerant of minorities and pluralism is a disaster for Jews. By Giorgio Gomel. Americans for Peace Now (APN) calls upon fellow American Jewish organizations to join it in condemning Israeli Prime Minister Benjamin Netanyahu’s embrace of the extremist right-wing political party Otzma Yehudit (“Jewish Power”). The leaders of Otzma Yehudit have publicly endorsed the racist ideology of Rabbi Meir Kahane, whose Kach movement was outlawed by Israel, the United States, the European Union and Canada as a terror organization. American Jewish leaders must not stay silent as Netanyahu not only endorses such a party as legitimate, but also works to bolster its political fortunes: here. According to Haaretz, Israeli Prime Minister Benjamin Netanyahu promised top positions in the next government to Jewish Home leaders if they merged with the small extremist party Otzma Yehudit, or “Jewish Power,” which is led by three prominent Kahanists: here. What Happens Now For Netanyahu After Indictment Announcement?. By Allison Kaplan Sommer, February 28, 2019. This entry was posted in Human rights, Peace and war and tagged Berlin, Jews, Netanyahu by petrel41. Bookmark the permalink. A day after Israeli prime minister Benjamin Netanyahu orchestrated the return of the supporters of the racist rabbi Meir Kahane to the Israeli Knesset, the American Jewish Committee, a major establishment Jewish organization, condemned the maneuver. On Wednesday, the AJC was one of a number of mainstream American Jewish groups that did not respond to the Forward’s request for comment on the merger of the Kahanist party Otzma Yehudit with the national religious party Jewish Home, likely guaranteeing the Kahanists a presence in the Knesset. Among those that did condemn the party merger on Wednesday were the Anti-Defamation League and the Union for Reform Judaism. This story ” Netanyahu Merger With Racists Prompts AJC Response ” was written by Josh Nathan-Kazis. The Arabs are also human beings. And also the Druze, and the gays, and the lesbians and… gasp… leftists.